If you don’t have much time, then below you can view a comparison of my top 3 Air Purifiers for the basement and large rooms. I took some time over my reviews in this section. 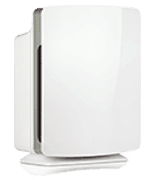 In order to find the best air purifier for the basement and big rooms, I had to narrow down exactly what to look for. I knew it had to be able to handle large areas, but also deal with certain types of pollutants like Mold and Mildew and at the same time capable of dealing with strong odors. A tall order to say the least! Basement air is the most polluted air in the whole house. If you have a basement, you know all too well about that funky basement smell. Basements are often connected to the rest of the home with ductwork, which results in polluted air traveling up to the rest of the rooms. Even the cleanest basement often has 10 times as many pollutants as other areas of the house. The winner of our 2019 award for the best large room air filter goes to the Alen Breathe-smart. If you read any of our other pages, you will see that we absolutely love this machine! But for very good reasons as you can read for yourself in our full review. I thought it was apt to also give it our award for the best basement air cleaner too as it is excels at purifying the air in large spaces as it can handle areas up to 1200 sq. feet. It comes equipped with sensors that evaluate the level of work that needs to be performed on the air in your basement and can automatically adjust the filtration procedure, so as to save power, while still producing the best result. The controls are simple and well-designed for intuitive use and hidden out of sight to maintain the sleek look of this unit. As we’ve stated before, it comes with a wide variety of front panel colors, mostly in fairly neutral colors, so you can match it easily to your home decor. Another asset that allows it to work well in a Basement is the child friendly system that makes it safe to operate in rooms that children use, which basements often are. Word of warning though, the manufacturer recommends that the filter needs to be replaced once every 9 months (approx), but depending on the air quality – you can easily stretch that out to over a year. This machine consistently gets top reviews and excelled in every test. Both industry professionals and user reviews are amazingly positive. What makes Basement Air so Bad? Basements with carpeting impair the air quality since the carpets absorb the moisture which is usually abundant in the basement. Such absorption causes high humidity and creates a favorable environment for mold formation. Due to higher moisture levels, gypsum wallboards become a common source of black toxic mold. 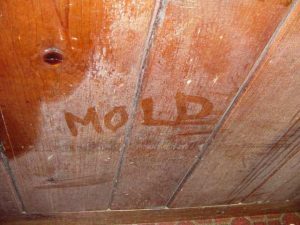 Mold spores get into the air and significantly worsen its quality. Basements usually have limited ventilation. This leads to the appearance of mold, bacteria and dust collection. Stagnant air with mold spores creates a serious hazard for your health. Even if you don’t spend too much time in the basement, the polluted air can flow up to your rooms. That’s why I would recommend all the homeowners to get an air cleaner for their basement. A solid air purifier with a high-quality filter can keep the air in your basement clean and prevent serious health problems for you and your family. After doing extensive research, I picked only three air filters for my basement air purifier buyers guide. I believe that these three offer the best value for money and I truly believe they will do the best job of keeping basement air as clean as possible. Please have a quick read through my reviews on this page to find out why…and then you should probably check out what individual users are saying on Amazon. 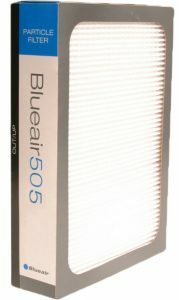 The Blueair 505 is one of the most popular air filters for people to put in the basement as its designed for large rooms (approx 700sq feet coverage) and can be wheeled around – which puts it at an advantage in extra large basements where it needs to be moved from one area to another. Even though this air cleaner comes with a hefty price tag, it is feature rich and many of them are designed to prolong the lifespan of the purifier and it’s filters. So it would seem to be worth the extra money you have to pay initially. 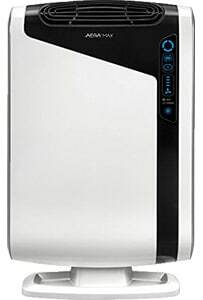 The Blue air 505 comes with a special HEPAsilent filtration technology, a built-in ionizer, Wi-Fi operation, 3 fan speeds, and manual controls. It’s Energy Star certified, ozone-free and CARB rated. This particular model piqued my interest due to the new HEPASilent filtration technology. This technology combines electrostatic and manual filtration approaches. The particle charging chamber charges the polluted air particles and then runs them through a filter. I would say that this technology is a big advantage in any air cleaner for a musty basement. Such technology makes this model low in maintenance which means you don’t need to change the filters as often. Since the 505 already comes at a high price, I was glad to learn that I can save on replacement filters. This is a very useful option that I truly appreciate. Running up and down the basement stairs to turn the air cleaner on and off is far from being fun, so being able to operate it remotely is a big advantage. Blueair provide a free app that you can download on any Apple, Android or Windows smartphone. Just sync it up with the machine and hey presto! no more trips down the basement stairs to turn it on or off. The Blueair ‘friend’ app also allows you to check on the air quality outside…in any country! It gathers data from more than 2,700 air quality stations located in over 150 countries. The air quality conditions are then rated from ‘good’ to ‘hazardous’. Since the manufacturer came out and promised a near silent operation, many experts have attempted to test their claims and the majority agree that this is possibly one of the quietest air purifiers on the market right now. Even at the highest setting, it works quieter than a dishwasher. While it might not seem important for some people since the purifier is far down in the basement that they don’t use, others tend to use their basements more frequently and would appreciate the silent operation just as much as they would in any other room. Another feature that I really appreciate is the caster wheels. This air cleaner is rather heavy. It weighs about 35 lbs. (16 kg). The wheels allow you to move it around the basement and other rooms in the house with relative ease. Since the 505 draws air from the sides and from the bottom, you can place it near a wall so it doesn’t take up too much space. I appreciated the simple design of the BlueAir 505. The manufacturer claims the design to be award winning. I can’t say that I can see why, but the simplicity is what attracted me. The 505 can easily fit into any basement or living room décor thanks to it’s simple shape and appearance. The unit looks like it serves a purpose. Yes, it’s rather large – however, you would have to assume they would make it smaller if they could…all that filter tech has to fit in! The manufacturer claims a five-year warranty but I decided to take a closer look into this matter. I found that it actually comes with a standard 1-year warranty. The 5-year warranty can only be received if the unit is registered within 60 days of purchase. It’s important not to miss this detail, otherwise, you’ll be left with the standard warranty. Since BlueAir is ready to give a 5- year warranty, it speaks highly of the product’s quality. This is an important point that I always look for when it comes to air filters. Even though it has been proven that ozone air purifiers can be harmful to our health, some manufacturers still use this technology. 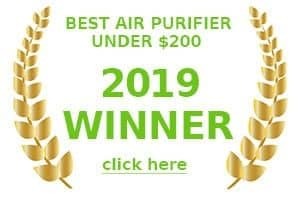 I chose this particular air purifier as a runner up for our basement air purification award as it claims a safe application of electrostatic technology without any ozone emissions. 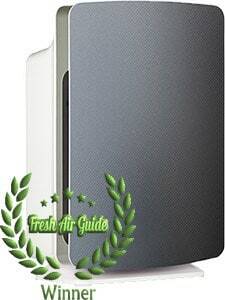 This air purifier has an Energy Star rating which means it’s energy efficient. With electricity costs going up year on year in most countries, this is an extremely important aspect not to be over looked. Some air filters (especially older ones) can be hugely inefficient and can really put a dent in that bill at the end of the month. The HEPA filters used in this unit are made from polypropylene. This material is especially useful for basements since it repels water and retards mold growth. The HEPA filters should be changed once in about 9 months depending on how much you use the air purifier. There is a filter indicator light that will tell you when the filter needs to be changed. When the light goes on, it doesn’t mean you are not protected anymore. You still have a few weeks to get the filter replaced…but you will probably start to get less clean basement air the longer you leave it. 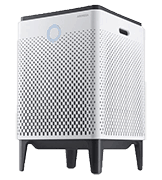 After reading all the reviews and case studies on the blueair 505, I can honestly say this is without question one of the best Air purifiers for the basement. 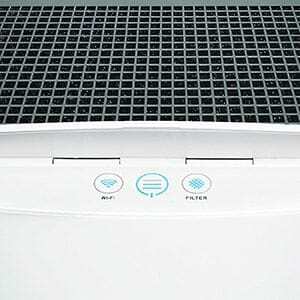 The HEPASilent filtration technology coupled with simple design, several fan speeds, and an Energy Star rating make this air cleaner a solid tool for clearing up the air in large spaces. The only downside seems to be the high price which is compensated for by long-lasting filters and energy efficiency. This particular air cleaner caught my attention thanks to its 4 stage purification feature. This is of particular interest to any allergy sufferers, as they require levels of air purification much higher than those who do not suffer from allergies. According to industry reviews, the Aeramax 300 excels at dealing with plant pollen, dust mites, and other pollutants that can cause an allergic reaction. This air cleaner is recommended for use in areas up to 600 square feet so most basements qualify. This particular model is CARB rated and certified by the Asthma and Allergies Foundation of America. It’s equipped with sensors that determine the level of air contamination and has a special mode for the flu and cold season. I decided to take a close look at the Aeramax 300 purification technology since it’s what makes this air filter stand out of the crowd. The first stage is the carbon pre-filter. It fights odors and captures large particles. Then the TrueHEPA filter goes on to remove all dust mites, plant pollens and other airborne irritants. 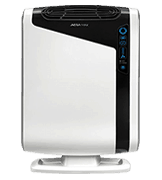 The AeraSafe antimicrobial filter protects the TrueHEPA filter from the mold, mildew, and bacteria. The unit is also equipped with an ionizer (PlasmaTRUE technology) that helps the filter remove even the smallest airborne pollutants. The carbon filter needs to be replaced once in about 3 – 4 months. The TrueHEPA filter can be changed once in about 9 – 12 months and the unit is equipped with a filter indicator that will tell you when the filters need to be replaced. This is my favorite detail in the aeramax 300. The sensor automatically detects the pollution level in the air and adjusts the fan speed to keep it pure. Since the only way we humans can detect airborne allergens is through our bodies, when our only indicators (sneezing and coughing) kick in, it’s usually too late to turn on the purifier. This sensor keeps the air clean at all times while saving you energy. The fan in this unit is far from being quiet so running it on high at all times is not acceptable for many people. The sensor regulates the speed according to the air quality and this makes it a very useful feature. You can also check out the air quality yourself by looking at the indicator. Blue means that the air is clean, amber – poor air quality, and red – highly contaminated air. 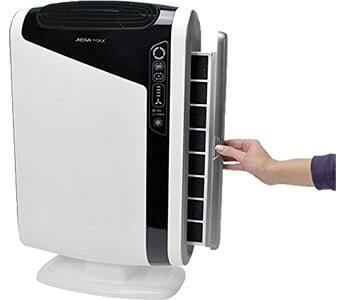 This air purifier has an Aera+™ Mode for cold and flu season. The manufacturer claims that this mode increases the air turnover rate by 50 %. What it means, in reality, is that the air filter works on higher fan speed and uses more energy. I liked the simple yet sleek design of this unit. It’s a good choice for a basement since the air intake works from the right and the left side. meaning there is no problem with putting the unit against the wall so it doesn’t take up too much space. The air cleaner features air grates that can be adjusted to regulate where the airflow goes. This might not seem to be the most useful feature for people who don’t use the basement often, but even during the short time you spend there, air flowing directly at you can be annoying. Different people have different noise sensitivity. This unit seems to be rather noisy when working on the highest setting unfortunately. Since it has a sensor that tells it when to switch the fan speed, you can be woken up by the noise levels suddenly changing. Again, this is only a problem for light sleepers since a basement air filter is usually far enough away from the bedroom. This matter might be important for people who have guest rooms in the basement. One more problem for sleepers: an indicator light that can’t be turned off. If you like sleeping in full darkness, this feature is a disadvantage. This is most certainly one of the easiest Air filters to operate. When it arrives, all you have to do is remove the wrapping from the internal filters and plug it in. I read that some people complained about the plastic smell coming from the unit, however, this sounds like a short term problem, and the majority of people with this device have not made any complaints about this. The manufacturer offers a 3-year limited warranty which I find sufficient. Long warranty usually speaks for the high quality of the product. Considering that this unit is rather moderately priced, such a long warranty is an advantage. Overall, this air cleaner for the basement gets glowing reviews from industry professionals and individual users alike. 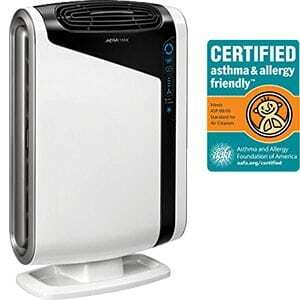 Apparently, the Aeramax 300 really does what the manufacturer claims: clears the air from all the allergens. There are bountiful reports from allergy sufferers extolling the virtues of this fantastic air cleaner. 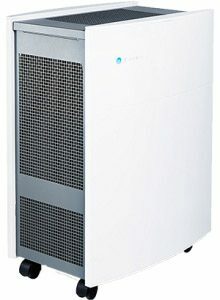 Good air purifiers that can service a large area are hard to find, especially those with a moderate price tag like this one. This model is designed to keep the air clean and fresh while saving you money on the energy bills. 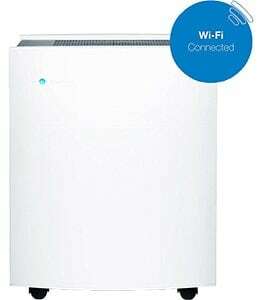 I would highly recommend this air purifier for allergy or asthma sufferers with large basements.